Our policy here at old plank, is that if at all humanly possible, regardless of cost, try to save the original leather, well in this case, the leather was like torn cardboard. 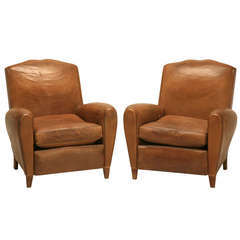 Our old plank upholstery department, completely stripped these French leather club chairs to the frame and rebuilt the club chairs from the ground up. We used old school techniques, utilizing horsehair, shredded coco, goose down and eight-way hand-tied coil springs. 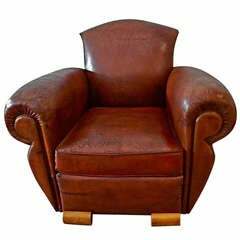 The leather, is a special color that we developed in house and we actually dye our own hides for the club chairs. 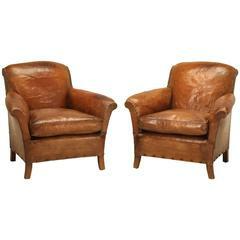 Basically, you are looking at a new pair, of 1930s French leather club chairs, that will sit like nothing else on the market. Completely restored from the ground up. 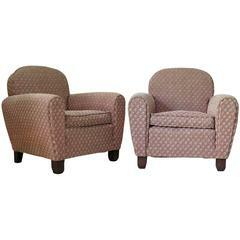 Sturdy pair of French Art Deco club chairs, upholstered in pink fabric with white floral motif. 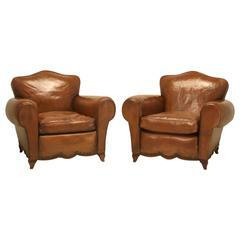 A unique pair of Italian Art Deco club chairs by Guglielmo Ulrich. Ebonized wood tripod base on gently curved and tapered legs. 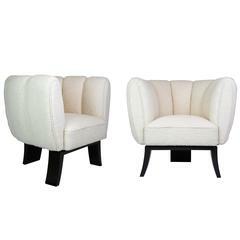 Channel tufted round back. Newly upholstered.